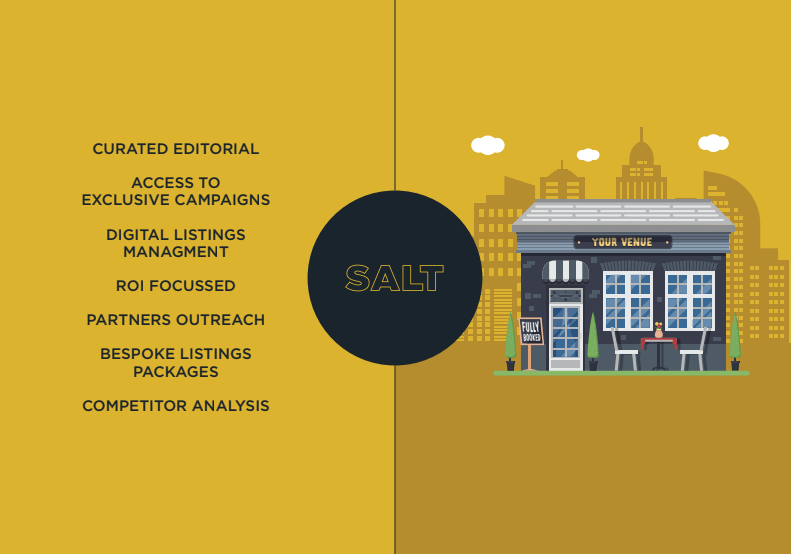 SALT is a boutique restaurant marketing agency that specialises in developing and implementing ROI-positive marketing strategies for restaurant and hospitality industry clients. Our team combines extensive knowledge and experience, enabling us to provide bespoke support for your marketing requirements. Many restaurants and bars find the demands of managing all digital channels untenable. Monitoring the bookings journey, liaising with third party websites, responding to editorial requests and maintaining an engaged social media audience all takes a considerable amount of time to deal with internally. SALT offers a resourceful marketing hub allowing the venue’s marketing team to access multiple layers of digital opportunities. Exclusive campaigns, bespoke editorial packages, focused partners outreach; all strategically curated by their team. All Salt Marketing’s activities are quantifiable and their approach transparent and effective. This is a powerful one-off report that provides a snapshot of the venue’s digital presence, together with unexplored marketing opportunities. • Newly appointed marketing managers who want to hit the ground running. • Operators who don’t have time to undertake hours of research. • Restaurant owners who want to identify marketing strategies to build their business and digital awareness. Following the delivery of the digital audit, SALT can be retained for a fixed term. • Actioning all points highlighted in the audit, immediately. • Providing your in-house marketing team with strategic support. • Streamlining all the communications with 3rd party websites. • Securing preferential pricing with selected partners. • Accessing exclusive digital campaigns. The retainer is flexible and it’s based on the venue’s needs. We recommend a minimum of six months engagement to really see the benefits of any agreed campaign.